In 1950, families in North Austin indicated interest in having a church and parochial school close to their neighborhood. Plans were developed for a new parish with the support of Most Rev. Louis J. Reicher, first Bishop of Austin. On September 4, 1956, St. Louis Catholic School opened its doors for the first time. 245 students were enrolled in grades 1-7 and it was staffed by four Sisters of the Holy Cross and one lay teacher. The first 8th grade class graduated in May of 1958. 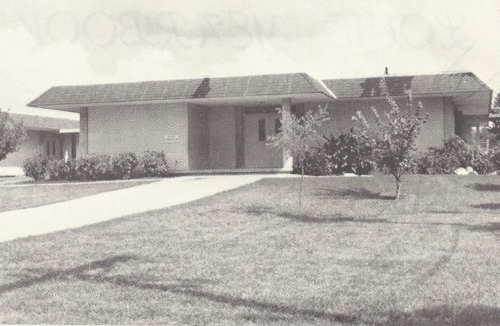 In 1967, the secondary and administration buildings were added, and the following year St. Louis reached its peak enrollment of 482 students. The gym and The Parish Activity Center were added in 1982. In 1984 the school board retained an education consultant to coordinate a self-study of the school which eventually led to the first accreditation status in 1986 by the Southern Association of Colleges and Schools. An addition to the secondary building was completed in 1991, which included the music, science, and math classrooms. In the late 1990’s there was a technology renovation throughout the school which included telephones and fiber optics in all of the classrooms. In 2012 St. Louis began to implement a one-to-one device program across grades 3-8. By 2016 the one-to-one device goal was achieved and each student in grades 3-8 was equipped with a Chromebook. Technology was added classroom by classroom thanks to generous donations by the Home and School Association, the parish, and families and friends of St. Louis Catholic School. These additions included iPads, interactive Promethean whiteboards, and a Makerspace that provides a hands on, creative space for students to design, experiment, build, and invent. In 2016, other exciting changes were made to our beautiful campus including a prayer garden outside of the secondary building, a playground for our younger students, and a Marian shrine dedicated to Our Lady of Guadalupe. Air conditioning was also added to the gym to create a more comfortable environment for school wide gatherings and athletic events. Beginning in the 2017-2018 school year, St. Louis Catholic School became the first school in the Diocese of Austin to offer a Catholic Montessori program for students ages 3-5. As we look ahead, it is our goal to build on our rich history and tradition carried out over 60 years, while setting a course for our future. It is our mission as a Catholic school to form our students in wisdom and holiness. At the start of the 2017-2018 school year a five year strategic plan was initiated so that St. Louis Catholic School will effectively continue its long standing legacy to provide an excellent Catholic Education for students in the greater Austin area.